I wrote about the most recent 30,000 American Airlines miles offer from Citibank for opening a Citigold account and last week, I signed up for a Citigold account. Even though I’ve had my account for little over a week now I already have a few good pieces of advice for those who enroll in this offer. 1. 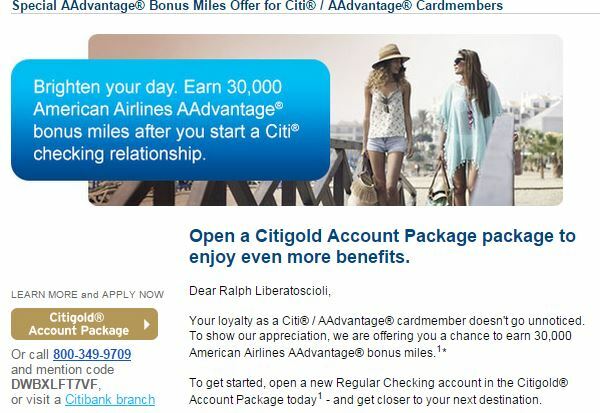 Make Sure the 30k AA Offer is Actually Linked to Your Account – I applied for my Citigold account directly through the email Citibank sent me with the offer by clicking the link in my email. The offer code pre-populated on the application form so you would think this offer would be properly linked to my account. Turns out, that wasn’t the case. Before I was going to bother with meeting the requirements for the bonus (which is quite easy with spending $750 on the debit card and completing two bill pays) I secure messaged Citi to confirm this offer was attached to my account. The rep was nice but couldn’t find the offer and had no authority to add it my account. I asked for the phone number for the right department except it turned out to be to the wrong department. I called the number the rep provided and was promptly told they couldn’t do anything and I needed to talk to a “personal banker.” The rep had heard of this issue and assured me it was no issue once a personal banker got it involved. I called the number I was given by that agent which I think led me to the general Citibank customer service center and I was told personal bankers were not available at this time. I got a little frustrated at this point and asked for the direct Citigold customer service number, which in hindsight I should have called first. Once I called the direct Citigold number (1-888-248-4465), I was able to make some headway as a very nice agent was able to add the offer to my account once I provided the offer code. She went over the terms of qualifying activity, asked if I had any questions and confirmed it was now definitely on my account. You can consider this point 1b but Citibank’s customer service is frustrating to say the least. I’ve detailed my experiences above and I know it was a holiday weekend when I tried to rectify this situation (so maybe that’s part of the issue here) but I don’t appreciate a run around from incompetent agents. Now maybe this is my fault since I didn’t deal with Citigold customer service right away but you would think one of the first two agents would point me in that direction. In the long run this isn’t a big deal to me since Citibank will not replace Chase as my primary checking account and I plan to close or downgrade this account once the miles post. 2. You Can Fund a Citigold Account with a Credit Card – This should apply to all Citibank checking accounts (not just Citigold) but I was successfully able to make my initial deposit with my Barclay Arrival + card. I got this hint from Doctor of Credit but I only chose to make an initial deposit of $1,000 to be safe (this was before a commenter on his site verified Barclays would work). Before funding the account, I called Barclays and lowered my cash advance limit to a $0 just in case this would code as a cash advance to avoid any fees. With Citibank, you have to fax or mail in a credit card authorization form. I faxed the form over on 2/6 and on 2/11 the $1,000 posted to my account and was coded as a purchase on my Barclay Arrival + card. Success! 3. You Can Save $100 on the Citi Prestige Annual Fee – One of the perks of a Citigold account is a reduced annual fee on Citibank’s premier credit card, the Citi Prestige. The annual fee is normally $450 but is only $350 for Citigold customers. It appears the best offer on this card is 60,000 Thank You Points which can be redeemed at a value of 1.6 cents a point towards travel on American or US Airways. 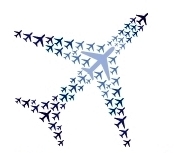 Additionally, Citi has just started adding transfer partners including Virgin Atlantic, Air France, Singapore and Hilton. I plan on applying for this card shortly and I’ll do a much more detailed analysis of the card at that point but this card looks very comparable to the American Express Platinum card albeit with much fewer transfer partners. Anyone else have any issues or success stories with the 30k Citigold American Airlines offer? I was conservative as I couldn’t find any data points of Barclays working (this was before Doctor of Credit had updated his post). If it I did it now, I’d probably do the maximum I could and pay it off before my Arrival statement closes. Would you be willing to share a screenshot of the 35k that posted as a purchase on your statement? I wasn’t targeted for the 30K AA Citigold account but I know people who have called in to open the account and get it over the phone. Is it possible to fund via CC when opening a Citigold over the phone? Or is it online only? Also, I have a few citibank basic checking accounts. Your point #2 states that you can fund any citibank checking account with a CC, not just Citigold. I recall when I went to open another basic citibank checking account online with a few clicks, there were no options for me to fund it with a credit card. Maybe this option is only when opening a checking account for customers without any existing checking accounts? If I wanted to do this, would I go to the CitiBank website and find a link for a CitiGold checking account to get started? I’m assuming once you start the process there is a link or icon for funding and that’s where you’d input your CC info? I’ve already set my cash advance limit to zero. Thank you for any details in advance. A few more questions if you don’t mind. Although my CA is set to zero on my US Airways Barclay card, I don’t use it often. If I call them ahead of time and tell them I’m going to be making a large purchase in order to circumvent a fraud alert, what would you suggest I say when they ask what the large purchase is for? Obviously I don’t want them to question me but they typically do. Do you know whether there are any tax implications when loaded over $11k into a checking account and finally, when you opened yours and then paid the CC off, did you use a check from your new account to do so draining the account to say $50? Thanks in advance…sorry if any of these questions are naive but I don’t want to make any mistakes. I applied for CITI Gold online with this promotion. But during the whole process, their system didn’t ask me for AA account number. I doubt how they credit miles to me after meeting the requirements. Do you have the same experience? I just call CITI Gold line. The lady there told me their system uses social security # to match up AA account. But I said the airline doesn’t hold my social and how they can use my social matching my account. That lady couldn’t answer. I would HUCA. That doesn’t sound right as who gives the airline their social? I know I’m replying to a comment that’s months old, but wanted to give an explanation incase anyone else comes across this site looking for info. Citi doesn’t need your AAdvantage number and only your social security number because the offer for the citigold checking account with bonus AA miles is a targeted offer to customers who already have a Citi AAdvantage credit card. They have your SSN and AA number from the credit card, so that’s how they can match your SSN to it when you apply for the checking account. Just got accepted. Funded with Barclay Arrival + for $1000 too. Don’t want to burn my bridges, AoR today has me at 175k Bonus miles. Only decline was from Discover IT. 718 FICO? WTF? Amex Gold Biz 75k, AA Citi Premier 50k, Chase Ink Plus 50k. Thanks for all the good work you do! Does anyone know of possible to fund with multiple credit cards?